It's beginning to look a lot like Christmas in the animal kingdom! 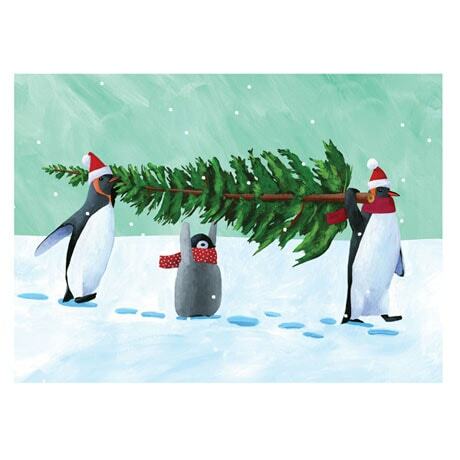 A pair of penguins and a gentle elephant—in jaunty stocking caps and "assisted" by their excited young chick and calf—carry home freshly cut evergreens. We're offering both images in boxed sets of fifteen 5"x7" note cards, with envelopes. 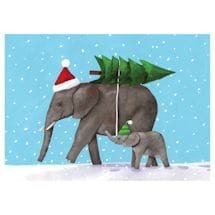 Our Penguin Tree Note Cards feature the inside message "Wishing you all the Joys of the Season," while the Peaceful Elephants Note Cards read "Peace on Earth, Goodwill to All." And after you address and mail your holiday cards, you can wrap your holiday presents in our coordinating double-sided Penguin Tree Gift Wrap and Peaceful Elephants Gift Wrap. Three 21½"x34" sheets are printed with soy-based inks on recyclable paper.